So anyway, I killed the villain1, saved the land, got the glory, and then the super long end credits. As a result I'm globally satisfied; I don't have the feeling I thrown money out of the window, but still I was expecting more, much more, from Bioware. 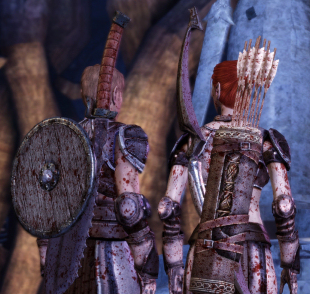 Globally Dragon Age is a good game, but it suffers from many issues, and the QA department did not really do a awesome job, the game has much more small glitches and issues than the average Bioware game. Not sure if was the price to pay for being acquired by EA, being rushed before being entirely done. 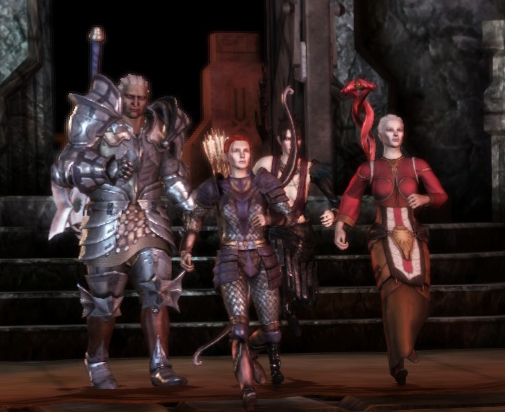 The first impression I had when I started to play Dragon Age, was that the game had been started a long time ago, then put on hold, and then only recently completed. The engine and the art suffer both of this issue. The rendering engine obviously is able to render some pretty nice post processing effects, some nice particles, and all that gives a pretty nice results during the cut scenes: Depth of field to make some elements stand out, heat waves around the bonfire, very nice faces on characters, great voices (mostly) and dialogues. 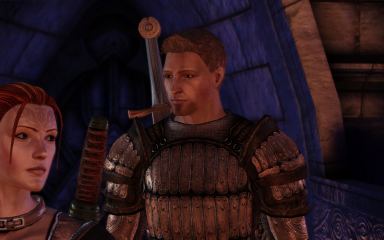 But then there is the game itself which takes more from NeverWinter Nights than from Mass Effect, unfortunately. Most of the dungeons are pretty generic, with the same chests, piles of books, rumbles, all over the place, many textures are relatively low resolution compared to the characters2. The story itself is nothing more than the traditional evil is back, we still have damn elfs and dwarfs. The only thing that stands out really is the number of spoken dialogues, quite good cut-scenes, some actual choices to do here and there, and I've been surprised by some unexpected things like some party members challenging the authority of the player's character and wanting to take control of the group, or the implications of playing with the approve/disapprove system to the point where personal relationship issues started to appear in strategic choices during the game. The work done on the party members is quite good. There's obviously a number of possible interactions, and the game handle things in a less typical way as most games where your choices are very black or white. Here you can do your little evil choice here and there, some people will disapprove, but it's not going to ruin the game. No more playing the perpetual angel here to save everybody, that's a good thing I guess. Now when playing, damn frustrations in so many places. What disappoints me the most, is that it was supposed to be the ultimate RPG that they always wanted to make for years and years, and the best they can come with as a story is that? 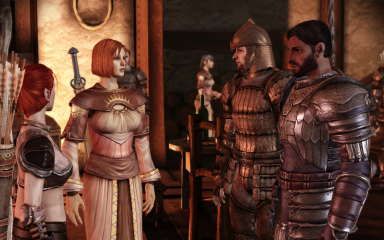 It really feels like the authors of the game wanted to have the opportunity to write their own "me too" high-fantasy story. In the end, not a bad game, but definitely not a contender for a game of the year award.